A fast comfortable cruising yacht with 5 berths, which is rigged for easy handling. 'Nore Sand': a fast comfortable cruising yacht with 5 berths, rigged for easy handling. 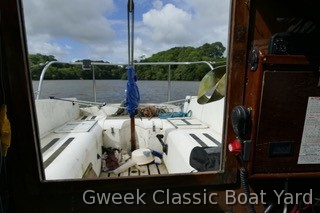 With two anchors, an 8ft GRP tender, solar charger, GPS, sonar fish finder, sea toilet, VHF radio, fridge and lots of cruising equipment. Mooring at Gillan Creek paid until August 31st 2018.